These days we see a lot of historical fictions hitting the book market. Not all of them are worth reading, and not all of them shall be ignored as well. Some authors do remarkable amount research to make the book look more realistic than the fiction. And, some rely on their imagination to make the book more interesting. 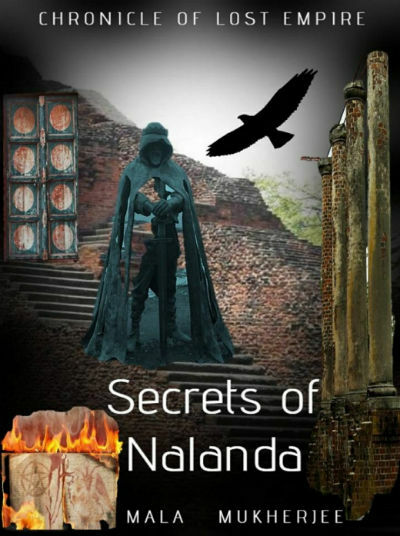 Recently we came across a book named Chronicle of Lost Empire : Secrets of Nalanda by Mala Mukherjee which has its own flavor in historical fiction genre. The book is available on Kindle only and it was free when we bought it from Amazon! And, in fact it is free till end of June 2018. May be the free promotion will be carried forward. But, at this price, it is definitely a good choice. As you can see the cover page has dark background and some remains of an ancient monument are shown in front. It tries to create an impression of the remains of Nalanda, one of the ancient yet historically connectable universities of the world. A hooded figure is also shown. While the cover page tries to create a good impression, it remains just good, it could have been better. A lot of details in the cover has been inspired from the Greek sculptures, monuments and history. Overall, a moderately good cover page. Actually, there are various plots running in parallel and eventually they connect each other. Let us focus on the most important course of events. There was a time when Nalanda, one of the finest universities across the globe was still enjoying its good time. Though, the glories are not at their peak, there haven’t declined altogether also. Despite falling under the ruling area of Pataliputra, it is an autonomous area in its own. The acharyas of this educational institution can make their own decisions without being worried about the influence of the king. The things, however, are never meant to exist in the same way throughout. There comes a time when the situation at the capital got its own dose of tension and eventually Prakashaditya, the worthy prince of the kingdom, rather than claiming throne, decides to leave everything and dedicate himself to the life of a learner. His intention was to retire from all political and social responsibilities and learn the lessons of life and beyond from Nalanda. One day, he renounced everything and left the kingdom on his horse who is more than a loyal loyal friend. The horse had an interesting name, Gatiman (the speedy one). The emotional bond between Praksh and Gatiman is something you can consider as the true example of friendship. Praksh was holding a message for an acharya at the Gurukul. However, before he could reach to his destination, around Ondontopura, he witnessed a brutal incident. He saw the protectors of a small caravan by a wealthy sheriff was treating the commoners quite improperly. Soon, the situation started getting tense and Prakash could not keep himself himself away from the incident and remain a mute spectator. He intervene and the things took unexpected turn. In order to save a poor child Praskash engaged in a fight and a prominent figure was killed. While Prakash didn’t kill him, ultimately he was considered as the suspect by the local authorities (who came to the picture later on), without knowing his identity. Oorja, the hot-headed girl was firm on her claim about Prakash’ actions. There is a bigger conspiracy running on and Prakash was caught into a web of events unwillingly. And, that is not all. In the land far away, various invaders are trying to strengthen their armed forces to attack Bharat. They are making all political, civil and forceful attempts to collaborate with their friend in a way that they can create a grand alliance which can beat the armies of Pataliputra. This time, they have already planted their spies at various important places to get latest and up-to-date key information. What are they planning? How the things move ahead in the kingdom? In Prakashaditya a genuine prince? Is there anything else in his mind when he withdraw his claim on the throne? Will Chandraditya do something fishy? Who is Budhaditya and what is actually happening at Bhodhgaya? You can get the answers for all these questions when you read this thriller. Author Mala Mukherjee believes in the motto “Where history remains silent, fantasy finds its place“. Actually she herself has mentioned it in the preface of the book. Following it, she came up with this book. I found the book remaining true to its genre. Mala seems to be a nature and animal lover. The way she has explored the bond between Gatiman and Prakash is really remarkable. While there are many instances where we see that the horse is expressing his feelings for his friend, I cannot mention them here in order to avoid the spoilers. However, I can say that there are instances where Gatiman dosn’t want to leave Prakash, and there are instances when he comes back to him. And, our history is full of such incidents. For example, remember Maharana Pratap and your will remember his horse Chetak. Remember Laxmibai, the queen of Jhansi,… the list can be ever growing. Even Steven Spielberg has dedicated a movie “War Horse” to such friendship. That is the charisma of peace, my son. Whatever you cannot achieve through power, you can easily achieve by love. Nothing can be solved permanently on the battlefield. My son, Kings come and die, kingdom wither away, people do not remember them; only remember those who who bring “change”. It is the rule of the Time, one King will die and another will come, one empire will fall and another will succeed; only the worth will win. If you fail in the battle, ask yourself why did you fail? It is not always the weapons that give us victory, but our inner strength makes us winners. Such things have timelessness in the lesson they convey. If you consider the present day scenario, anywhere in the world, you will find a substance in the below mentioned lines. …Protest was not for poor, but for rich; he should learn that already. Here is another interesting line, which can give hope even in darker times, and at the same time, suggest one to not let the success took over the emotions. Good or bad, everything has to end one day. I like the way the author has talked about the cleanliness. She, rather than lecturing on how important it is to keep our surroundings clean, explored it pretty effectively. It was the custom of Nalanda to salute those who are sweating to keep it clean. When going to a specific place, one of the most respected acharya of Nalanda stops to acknowledge the work of cleaners and paid them respect! Can we imagine that in today’s time? Well, if we don’t, then how can we claim that we understand the importance of cleanliness? I remember than in one of his speeches, current prime minister of India told that, in the morning when the street cleaner comes to clean our street, we refer to him as “Kachrewala“, but just remember that he is “kachra saf karnewala“! Those who spread dirt on the road should be called Kachrewala, not the one who is cleaning it. But, in the agenda to see political stuff in everything, we often miss such important stuff. Of course, it was the time when teacher was respected a lot. As it is referred in famous Hindi TV Serial Chanakya – “शिक्षक कभी साधारण नहीं होता, प्रलय और निर्माण उसकी गोद में पलते है।” – Mala, refers the same thing here in quite simple words. … a teacher is not bound to serve the King…. The teachers of Nalanda used to be persons with the strong characters. They usually kept living a simple life and even refused to have a servant or maid as far as possible. And, they were fearless and had courage to stand against anything they found wrong. And author has explored it in the book effectively. If your intentions are genuine, destination finds you, my son. Disobedience is the result of dissatisfaction. There is no Ultimate Truth, My Son. All Truths are tentative. Some of them were too skinny to project their bones. So, now you yourself got an idea about what to expect in the book, in terms of literary qualities. There are so many characters in the book, let me name a few of them: Prakashaditya, Oorja, Chandraditya, Acharya Budhaditya, Swambhu Dev, Gatiman, Padmanabha, Girima,… You require to pay attention while reading this book. If you are looking for a light read, it is not that. Also, if you read the book in instalments, it is possible to lose track of some happenings. While the reference of Bodhgaya, Taxila and Sankhya lipi connects you to the past; there are some words like Krosh (actually, I personally feel that it should Kosh – a unit of distance measurement) where you may expect better words. Use of footnotes and a detailed glossary could have been made this book even better. I will suggest you to not to skip reading preface and prologue. A little lengthy and complicated book which requires the reader’s attention to it, which remains true to its genre, provides you the thrills expected, good at literary qualities. It is a a genuine attempt to pen a worthy historical fiction which you will love to read.